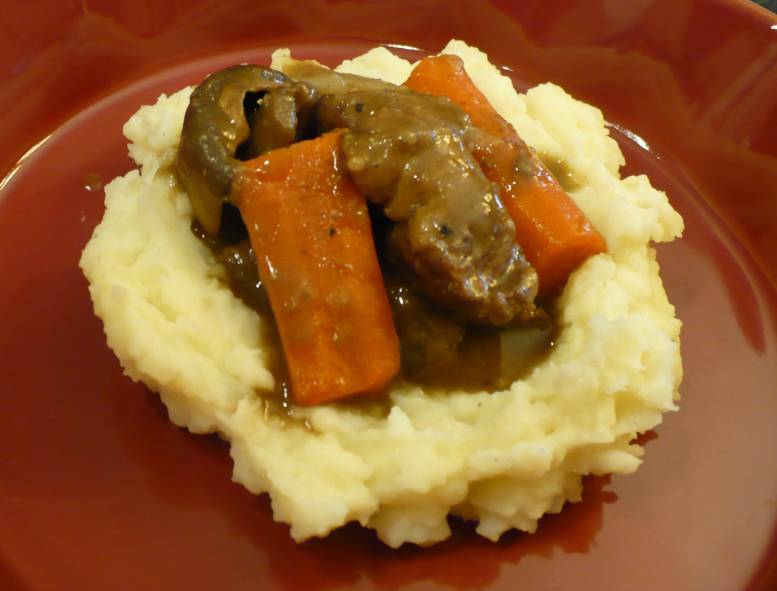 For day #13 of Soup Month, we have a Beef Stew served inside a circle of creamy mashed potatoes. Instead of including the potatoes in the stew, where the potatoes sometimes tend to get a little mushy, we decided to serve them mashed and the results were yummy. It was a nice twist to a classic dish. To prepare beef: Use a paper towel to pat the meat dry. In a small bowl, combine 3 TB flour, salt, paprika and pepper. Toss beef with flour mixture to evenly coat. In a large soup pot or Dutch oven, cook beef in batches in oil over medium-high heat, stirring often 4-6 minutes or until browned. Remove meat to a plate. To the soup pot add wine, sitrring to loosen any browned bits from the bottom of the pan. Return beef to pan; add beef broth, thyme, bay leaf, and 1/2 tsp salt. Bring to a boil, cover and reduce heat to low. Cook 1 hour, stirring occasionally. Whisk together 1 TB flour and 1/4 tsp salt then add 1 cup of hot broth to the flour mixture. Whisk until completely smooth, then blend mixture into the stew. Cook stew 20 minutes longer, stirring often, until stew is thickened. Place a scoop of mashed potatoes in the center of a soup bowl and make a hole in the center of the potatoes. Add a generous scoop of stew to the center of the potatoes and serve. Serves 6-8.